We’d drunk like Romans (with all due respect to any Romans reading). It was late and time to go and talk to some NRL LEGENDS. 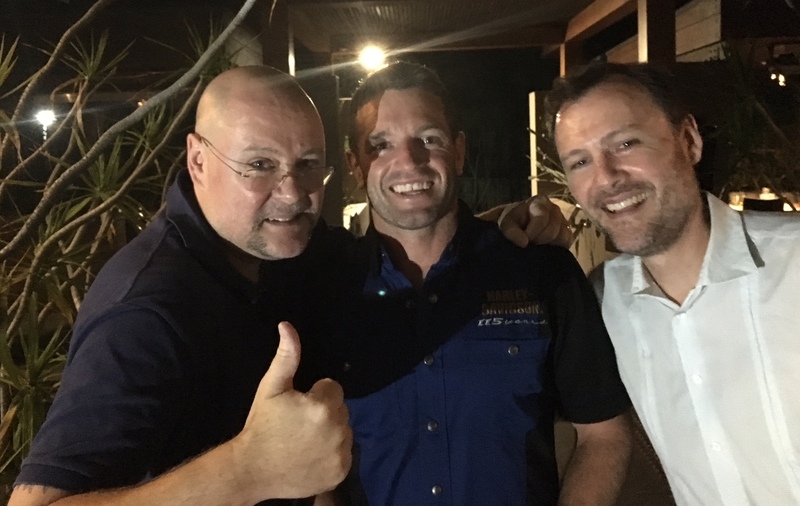 Last Thursday I was at a Hogs For The Homeless fundraiser, run by awesome ex-NRL players like Josh Perry, for Youth Off The Streets. A superb charity. They don’t come any higher on the “legend” totem pole, than Brad “Freddy” Fittler. Most capped player for the Blues, captain of Australia and newly appointed Blues head coach! My brother and I, and three blokes from our table, went up for a photo. Possibly second only to Freddy, from a Blues fan’s perspective, is the amazing Danny Buderus. A phenomenal player who looks like he’s been bench-pressing his Harley, not riding it. Danny walked out to the car park to leave. I went racing after him, but him still being as fit as all hell and me, not so much, by the time I had covered about 5m (and stumbled), he was 30m away. I had to call out. He was a long way away and my brother and I were two drunk lads, so I expected the old SORRY BOYS. GOT TO GO. But he didn’t. Like an absolute legend he ran back to us, we congratulated him on his appointment as assistant coach and thanked him. Then back to the bar and who happened to be standing there all on his lonesome? Just Brad “Freddy” Fittler. In my memory the conversation went something like this. Freddy – “Oh.” His keenness seemed to wane. Then I went on to list out a few players who definitely should be in. Then I went on to discuss others and their relative merits. Freddy, was absolutely brilliant and stayed for at least ten minutes, listening intently. He didn’t have to. In all the excitement, I drunkenly spilled a little of my beer. Me – “Whoa whoa”, I yelled to my beer. I thought it unlikely, but just in case Freddy wasn’t getting as much out of our conversation as I was, I looked for a way to give him a rap. Me – “Well Mitchell Pearce is a good half-back, but a good half-back, needs a great five-eighth to pass the ball to and let him make most of the decisions. And we haven’t had a great five-eighth since… well since you Freddy.” I slapped him on the chest. 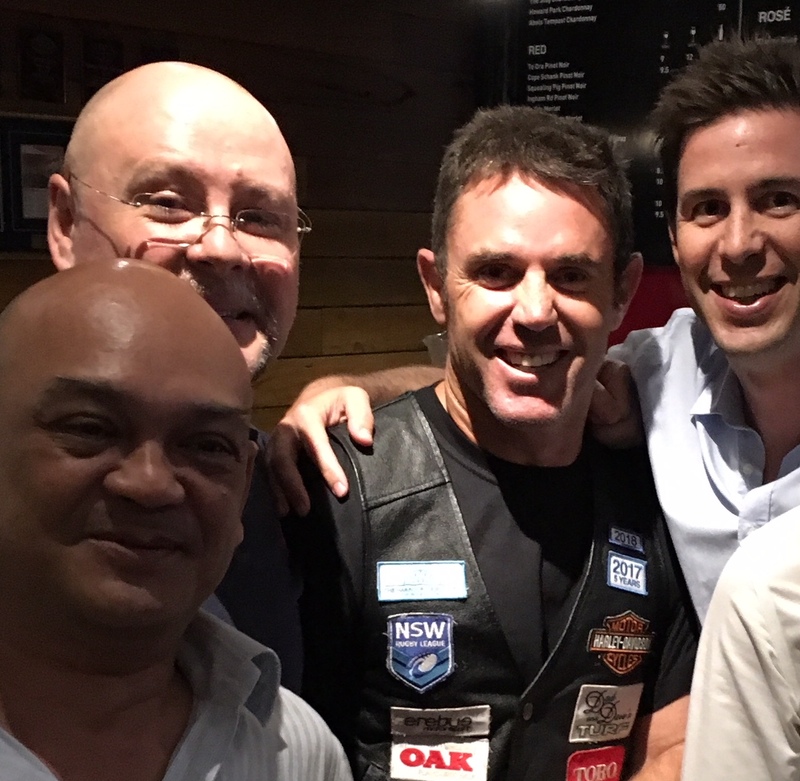 Brad “Freddy” Fittler, one of my all-time hero’s, put his arm around my shoulders. With great men like Danny Buderus and Freddy Fittler in charge of the Blues, we cannot lose. World class hey? Thanks Tyler. I loved this blog! It had a reasonably happy ending(despite the phone number!) and you and Linc had a fabulous time! Not one but two NRL greats in one night! Let’s hope the Sea Eagles shine this season!! !